Used Mercedes A Class Review - 2018-present | What Car? What's the used Mercedes A Class hatchback like? 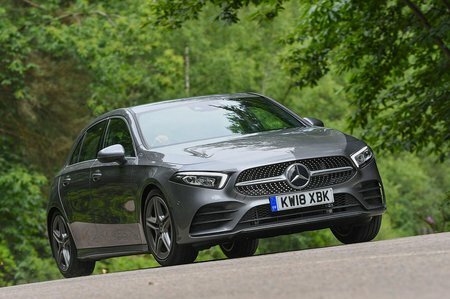 To take all the qualities of the best Mercedes-Benz cars and wrap that up in a small and neat hatchback sounds like a recipe for instant success, but the life of the A-Class has always been a little bit chequered. The first iteration was innovative in its styling and packaging but had its reputation sullied by the infamous ‘elk’ test, while the second generation car never seemed to capture the public’s imagination. The third was very different, being more mainstream and more stylish and it sold more, but it was not a critical success. And so we have this all-new fourth generation car, which takes the good points of the third and ups the driver appeal and adds some extra pizzazz to the mix. There’s a good choice of engines, for one. Petrol fans have three to choose from: the 134bhp A180, the punchier 161bhp A200, and a 221bhp 2.0-litre petrol engine in the A250. On top of that, there’s also a range-topping and Tarmac-ripping hot hatch called the A35 AMG. Meanwhile, diesel lovers can choose the extremely economical 114bhp A180d that comes with a seven-speed automatic gearbox as standard. Trim-wise, entry-level SE gets you most of the basics, including (relatively small) 16in alloy wheels, air conditioning, cruise control and keyless start. The next-level Sport gets you more attractive 17in wheels, more powerful LED headlights, dual-zone climate control and various styling enhancements. Range-topping AMG Line adds even more but pushes the price up, but you could from new add the Executive package to the lesser trims, which gets you the larger 10.3in media screen, front and rear parking sensors and heated front seats. If you’re feeling flush, look out for the pricier Premium package that adds all of that and more, including a 10.3in instrument cluster, keyless entry, an upgraded stereo and cool-looking ambient lighting. On the road, there’s just a hint, with the lower-powered petrol and diesel units under the bonnet, of gruffness. Certainly the A180d doesn’t feel especially quick, and nor does the A200, and there’s more noise than you’d want, but both get by fairly well on the open road. With the seven-speed dual-clutch automatic gearbox there’s also a slight hesitation when pulling away from a standstill, as if it’s deciding which gear to use, and it can occasionally change down rather abruptly at higher speeds, too. For most of the time, admittedly, it changes gear smoothly and quietly. The steering is quick and responsive, too, and well weighted, and the car handles corners with aplomb, with good body control and reasonable levels of grip. It might not be outright fun, but it is stable and secure. Whereas the previous A-Class was often criticised for its firm ride, the newer car rides well, most of the time. It’s quite supple over patchy roads, and generally nicely fluid and compliant over bigger bumps, although it can be a little jiggly at low speeds on broken town roads. Where it doesn’t feel so competent is in the area of refinement, particularly noise from the engine and the road. Certainly, the A180 and A200 both sound a little boomy, and road noise is overly present, although wind noise is very well suppressed. Inside is an interior of rare quality. It’s easy to find the right driving position, with plenty of manual adjustment in the seat and steering wheel, and the seats are supportive. All versions of the A-Class come with a 7.0in digital instrument cluster behind the steering wheel and a 7.0in infotainment screen in the centre of the dashboard, both of which sit behind one giant piece of glass. Opt for the Executive equipment package and the 7.0in infotainment screen is replaced by a 10.3in version. If you add the Premium package, the instrument screen is also enlarged to 10.3in, the two neighbouring screens combining to look like one giant widescreen that stretches across more than half of the width of the dashboard. It’s impressive, as is the design of the interior, and with its lashings of shiny piano black plastic, leather, wood and metal in all the important places. There’s plenty of space up front, too, although lanky passengers might find it a bit tighter in the rear, especially if sat behind a taller driver. The rear seats fold in a 60/40 split, and the boot is big enough for a large weekly shop or a holiday away for two. Fold the rear seats and the floor is nice and flat, although there is quite a high lip at the entrance to the boot that you’ll have to haul things over.